To cut through the jargon and to put this simply, Hegel is saying that we know who we are by the relationship we have to others—our parents, our siblings, our spouses, our children, our colleagues, and so on. To be Carl Trueman is to exist in a network of specific relationships with other specific people, such that if I try to imagine what it would be like to be me but to have different parents, different friends, and so on, my head starts to spin. That person, whoever he might be, would not be me. Bandying terms like ‘cultural Marxist’ and ‘racist’ around simply as a way of avoiding real argument is shameful and should have no place in Christian discourse. So what has this to do with cultural Marxism? Karl Marx—Hegel’s most famous one-time disciple—turned Hegel on his head (and thereby, he argued, put him the right way up). And that move had profound consequences. Like Hegel, Marx believed that human identity is constituted by social relationships; but—and here is the crucial move—those social relationship are not, as with Hegel, determined by thought, by ideas. They are, at root, material—specifically, they depend on the nature of one’s place in the economy. This might sound like a fairly abstract point, but it is in fact a matter of great practical importance. If I’m constituted by my social relations, and all social relations are at root economic, then all social relations are also political. That means that everything that makes me into me is political as well. The notion that some social organisms—say, the family, or the church, or the Boy Scout troop—are pre-political, that they fulfill an important function not directly related to politics and stand outside the scope of political struggle, is thereby ruled out of bounds from the start. Culture—and everything in it—is a matter of politics, of the overall shape of society, of who oppresses and who is oppressed. In light of this history, it can be argued that, culturally speaking, Marx did win—because his vision of a society where everything’s political is our world. From cake-baking to what consenting adults do in the privacy of their own bedrooms, from the gendered membership of school sports teams to the ordination requirements of a church to the casting of an actor in a movie, everything has taken on universal political significance. This is now part of the intuitive way in which we all think about society—whether we’re on the right or the left. Once one side decides, for example, that the Boy Scouts needs to admit girls in order to break down gender inequalities, then those who oppose this change aren’t acting in a politically neutral way. They too are taking a political stand. The Christian Twitterverse is often embarrassing on this score, betraying both shallowness of thought and also cavalier contempt for the reputations of others. This is why there is so much pressure for churches to speak to whatever is the political issue of the day. We live in Marx’s world—a world where the cultural imagination is gripped by the idea that everything is political. Silence in today’s climate on any issue by anybody in any institution is unacceptable, for to take no political stand on anything in our world is in fact to take a political stand—a stand for the status quo. Resorting to arguments about the church being otherworldly and focused on heaven sound in the modern ear like a vote of support for the perceived injustices—sexual, economic, psychological—of the world as it currently exists. Historically, of course, this has often proved a false dichotomy. It is no zero-sum game: from the Genevan Company of Pastors to the Clapham Sect to the 19th-century Free Church of Scotland, sound heavenly mindedness did not preclude care for the poor, the weak, and the vulnerable. Yet in today’s secular, politicized culture—focused as it is on this world—it is easy for Christians to mistakenly think that a heavenly focus is merely a way of rationalizing a callous disregard for others. Evangelical Press (2018). 130 pp. $8.99. C. S. Lewis readers will identify the main title of this new book: Melvin Tinker uses Lewis’s prescient fiction work as a launchpad for a fascinating look at the rapidly changing worldview of Western civilization. Too often books dealing with these issues are academically inclined and not accessible by the ordinary reader: that is not the case here. Based on a lecture delivered at GAFCON in June 2018, this book will stimulate thinking and open the eyes of Christians to the dangers of the worldview relentlessly promoted by the media. This then brings me to accusations that Christians who are interested in social issues are cultural Marxists. Both sides need to be careful in this matter. First, the ninth commandment is arguably the greatest moral casualty of the world of Twitter, where half-baked slanderous insults can be fired at strangers with no risk of any personal comeback on the tweeter. The Christian Twitterverse is often embarrassing on this score, betraying both shallowness of thought and also cavalier contempt for the reputations of others. People using the “cultural Marxist” label for those they criticize—as people who casually throw around accusations of racism and the like—should make sure the claim is part of a sustained argument justified by appropriate evidence. 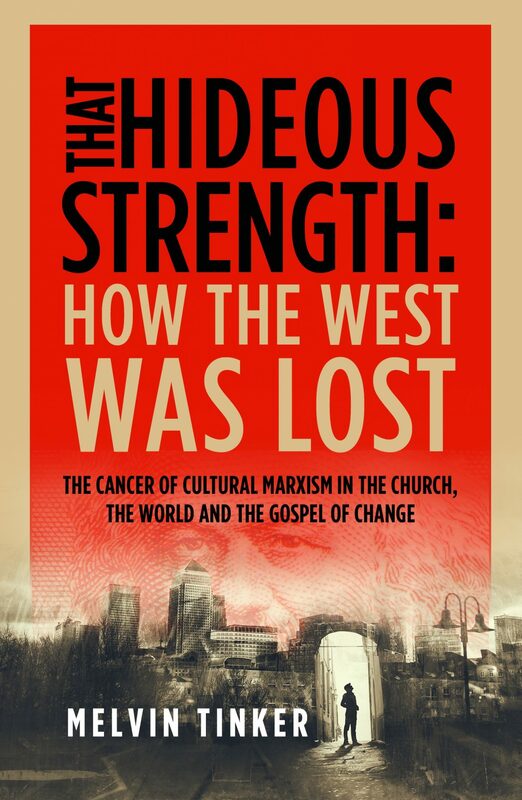 This is what Melvin Tinker does when he uses the term in his recent excellent book, That Hideous Strength: How the West Was Lost. Bandying terms like “cultural Marxist” and “racist” around simply as a way of avoiding real argument is shameful and should have no place in Christian discourse. On the other side, however, Christians enamored with social transformation and who bristle at any notion that the gospel is more to do with things above than things below, would do well to ask whether they’re allowing the tastes of this culture-is-always-political world to intrude inappropriately on their own theology. To deny the pre-political, to focus on institutions, to condemn anyone whose church isn’t constantly addressing the latest fad of the 24-hour news cycle as somehow sinning—that is to mimic the world’s values, the world’s practices, and the world’s cheap outrage. In fact, calling that kind of behavior cultural Marxism is to flatter it far too highly, implying a sophistication that half-baked cheap shots simply do not possess. The relationship between church and society has been perennially vexed and frequently a point of dispute between those who were otherwise united. The culture of today, with its politicization of everything and its tendency to reduce all thought to the level of a banal tweet, is particularly ill-suited for dispassionate reflection on the Bible’s teaching on these themes. That is a shame. Perhaps serious Christians might spend less time hammering each other on Twitter and more time working hard in the local church, talking to the people they can actually influence—those with whom we have real relationships and a common church community. This has to be better than posturing on social media in a way that may well feed our sense of self-worth but really only clouds the major issues of our time and influences nobody except those who already agree with us anyway. And perhaps those on Twitter who are so full of social justice, pro and con, might devote the time they spend fruitlessly firing off insults to instead visiting the shut-ins in their churches or opening their homes, helping their local communities, and doing something that makes a real difference to real people. Just as brain surgery cannot be done with a sledge hammer and a chainsaw, so careful theology on contentious issues cannot be done constructively in 280 characters. Marx, of course, famously prioritized action over theory. Maybe that is one bit of Marxism from which we might all learn—prioritizing actual action in our local churches and neighborhoods over hours spent on Twitter, Instagram, and Facebook, where we can parade our love for all in general but in reality love no one in particular but ourselves. Carl Trueman (PhD, University of Aberdeen) is professor of biblical and religious studies at Grove City College in Grove City, Pennsylvania. He has written more than a dozen books, including Histories and Fallacies: Problems Faced in the Writing of History, Luther on the Christian Life, The Creedal Imperative, and is currently co-editing with Bruce Gordon the Oxford Handbook of Calvin and Calvinism.